« Floral Crystal Comestic Makeup Bag Only $1.69 SHIPPED! Looking for a new spring cupcake recipe to try? I have one for you! 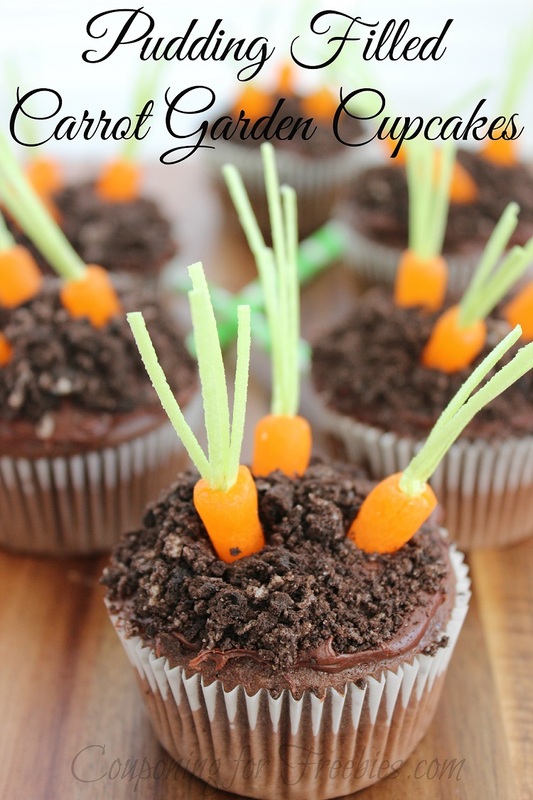 You can make these super easy and very cute Carrot Garden Cupcakes. So if you are trying to rush spring here (like I am), then this is a recipe for you. Don’t worry it is not one of those recipes that look really cute but is super hard to make either. Trust me even the kiddos can make this one. Make cupcakes according to directions on the box. Then allow to cool when they are down baking. Now make Pudding according to directions on the box. Cut a small square in the top of each cupcake and remove a chunk from the middle of the cupcake. Or you if you have a handy cupcake corer they make it super easy! Now place pudding in pastry bag or in a sandwich bag and clip corner to squeeze the filling in. Fill pudding into each hole of the cupcakes. Then put the piece of the cupcake that you cut out back on top like a “plug”. Time for the frosting. Mix butter and cocoa together until smooth. Then add in the powdered sugar. Slowly add a little milk in until frosting reaches the right consistency. Carefully cover the top of each cupcake with frosting. Sprinkle frosting with crushed Oreos so it looks like dirt. Cut grass into 1″ lengths. Using a toothpick make a hole in one end of each piece of candy and insert some of the greens in each hole. Now carefully place several carrots down into the top of each cupcake. That is it! Not you have yummy pudding filled carrot garden cupcakes. Looking for more recipe ideas to try? Be sure to check out our recipe category!